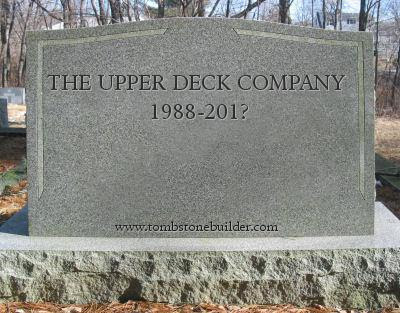 Stale Gum: UPDATED: The Upper Deck Death Pool. After the contest is over, and a winner declared, I will e-mail the winner's mailing address to everyone who entered. You can then send them your UD cards directly. In the meantime, YOU MUST DECLARE YOUR PRIZE POOL CONTRIBUTION ALONG WITH YOUR ENTRY! Any entries that do not follow BOTH steps 1 AND 2 below, WILL BE IGNORED! The fat lady is warming up her vocal chords. Keyboard Cat is about ready to play 'em off. Select your favorite cliche, but with the news that Upper Deck has fallen behind on royalty payments with the MLBPA, combined with their loss of an NFL license, and their twin courtroom defeats at the hands of Konami and MLB Properties, things ain't looking so great at Sea Otter Place. So, whaddaya say we have a little fun at a doomed card company's expense, huh? Introducing the "Stale Gum Upper Deck Death Pool." Here's how to play..
2) Contribute something of value (preferably Upper Deck related) to the "prize pool" as your entry fee. Closest to the actual date of corporate death without going over (Price is Right style) wins! ... this stack of 93, count 'em, 93! different Upper Deck 20th Anniversary inserts. My contribution: UD Goodwin Brandon Webb JSY Card and UD Miguel Tejada JSY card. I'm going with Sept. 1 of 2010. I'm offering up a Baseball Heroes Blue parallel #'d to 199 of Joe DiMaggio, a '09 Ballpark Collection Big Z #'D TO 699, and a vintage 1990 UD Sammy Sosa RC. I'll go with May 20th, 2010. As for contribution, I'll find a few UD trinkets and shoot 'em your way! I'm going with June 30th.Please send me your address and I'll see what I can "dig up"! July 28th, 2010..... my contribution will be a large pile of 2007 Upper Deck MLS cards and card from one of the best UD sets ever: a 1994 SP Holoview FX Ryan Klesko. 9/28/10 is my day of the end for UD. Send me an address and I will send you a contribution for the cause. August 16th. A Guillen and a Dontrelle,shown on my blog. Hey S.G., I'll contribute a lot of 5 different Chipper Jones RC/Prospect Cards. I guess they'll fall into the graveyard of burned wax on August 25th, 2010. 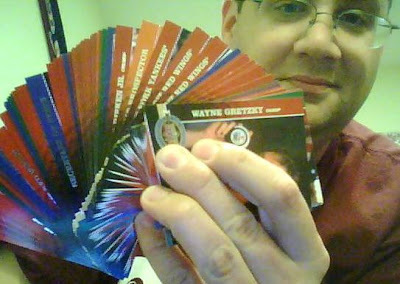 I'm going with 10/10/10, I will give up 10 Upper Deck serial numbered cards (both football and baseball). Ten (10) 2007 or 2008 UD RC Certified Autographed Inserts!